Japan is a major importer of bluefin tuna from around the world. (CNN) -- Atlantic bluefin tuna will not be added to a list of banned exports, following a vote on Thursday afternoon in Doha, Qatar. The vote was held among the 115-member nations who have signed the Convention on International Trade on Endangered Species. The popular sushi staple has been the focus of international attention as East Atlantic and Mediterranean populations of the fish have decreased by an estimated nearly 61 percent in the last decade, according to International Commission for the Conservation of Atlantic Tunas (ICCAT), the inter-governmental group that manages tuna fisheries in the Atlantic Ocean. The proposal to ban export of bluefin tuna was defeated by an outright majority, according to John Donaldson, the chairman of the committee tasked with hearing the proposal. The proposal, originally raised by Monaco, aimed to reduce the overall harvest of Atlantic bluefin tuna. ICCAT has been the target of criticism for what many see as lax enforcement of its own limits. The proposal by Monaco noted that, in 2007, an "independent review of ICCAT," conducted by reviewers that ICCAT appointed concluded that "ICCAT contracting parties' performance in managing fisheries on bluefin tuna particularly in the eastern Atlantic and Mediterranean is widely regarded as an international disgrace." 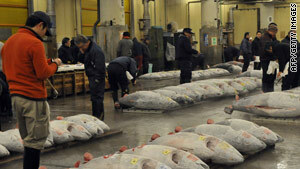 Monaco's proposal noted that, on ICCAT's watch in 2007, over 32,000 tons of bluefin tuna were exported to Japan alone. The total allowable catch for that year for the whole of the Atlantic Ocean was just 29,500 tons.